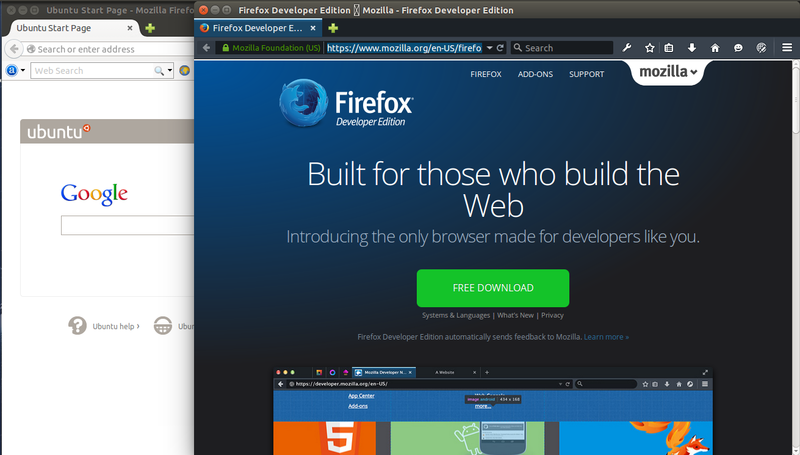 Today I wanted to try out firefox 37 developer edition. Since it is a developer version it may have some bugs, so I decided to keep my standard version and checkout new mozilla firefox developer edition. Our main idea is to place the firefox developer edition in /opt directory create a symbolic link in /usr/bin directory pointing to new firefox executable. Recommended reading Install firefox on Linux. Here is the way to use both versions of mozilla firefox at a same time. Download mozilla developer edition from https://www.mozilla.org/en-US/firefox/developer/. Extract the tar file and move that file to opt directory by changing a name. (By default when you extracted the tar file you will get firefox as a default folder name). create a symbolic link in /usr/bin (or any directory in 'path' environment variable) pointing to your new firefox dev folder. For instance I downloaded a developer edition from the mozilla (version 37) website and placed in the Desktop. Then I use below commands to setup new developer version. So, that's it. I just have to type "devfirefox" to checkout new developer edition and I can use standard edition by default. Any hugs or bugs please comment below. Thanks for reading.